Matara located in the Southern region of this paradise island is undoubtedly one of the most important cities. Matara in the South of Sri Lanka owes its name to its position. It was originally known as Maha Thota. It is a sanskrit word derived from Maha Theertha commonly used to indicate a Ferry. Many called it so, meaning the great Ferry. Matara's main claim to fame is river Nilwala which meets the sea at this point. Hence the name Maha Thota which later came to be known as Matara. Being a coastal city, it was an easy victim of the foreigners who gained control of the Maritime provinces. Portuguese, Dutch and the British had set their feet here at one time or the other. Archaeological remains show that Matara has been one of their attractions. Matara Fort, the Star Fort and the Nupe Market are the famous landmarks. They are a part of the colonial heritage. The archway into the Fort which house many official, mostly judicial buildings, the surrounding ramparts, the clock tower which still remains gives a picture of the history of foreign occupation. U. L. A. Gunasekera in his story "The Croc which saved his friend from the Jaws of death," giving a vivid description of the Fort states that it was made so by the Dutch colonial Masters who built a high granite rampart extending from the sea shore to the Nilwala river. The Dutch fortified it further by building a moat to prevent Sinhala soldiers entering the Fort." Then the Star Fort on this side of the river is a fabulous piece of architecture reflecting their wonderful strategy, in maintaining their position. Nupe Market believed to be the oldest surviving Dutch building at the other end was a great bazaar full of trade and business activity. Still another proud landmark of olden times, the colonial era was the Matara railway station, which terminates the Southern bound railway line. It reminds a by-gone era you can never forget with all the old vehicles, cars, buggy carts, hackeries etc. parked there, was waiting the arrival of the commuters to be dropped at their destinations - a sight very interesting and joyful. I have a pleasant recollection of the buggy cart, it being the popular mode of transport to school which we enjoyed very much. Matara was the most visited city in the South. It had become the chief city of the Southern born proud people of the region. As you proceed along Colombo-Matara road to this glorious city you reach the town limits from where this highway is known as the Broadway road, leading towards Kotuwegoda across the bridge with the famous bus stand, the post office, theatre halls, Mosque and the playground at present named after the person who made his motherland known in the world with his tremendous sacrifice for sports. It speaks volumes of an illuminating cricket personality gifted to Matara, the whole of Sri Lanka and the universe. To journey back on time before you reach the bridge right opposite the Bodhiya there was the urban council, police station and the Bank of Ceylon which was originally the residence of Dr. Lionel Silva. This road leading to Nupe, Thotamuna, known as the Main street had rows of shops specialising in textiles and general goods. On to your left from the Bodhiya was Uyanwatta grounds utilised for sports activities of the area, the hospital and at the entrance to the hospital, the famous Star Fort. Near the turn to the hospital there were fresh fruits in abundance with the fruit-sellers enjoying their hard-earned money while rendering a service to the passers-by. 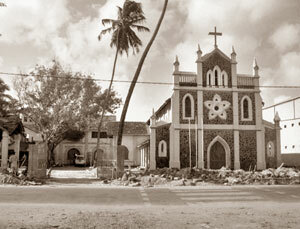 Matara was the home to so many races and religions. Town's population was a mixed one with wide majority, Buddhists. There was a fair number of non Buddhists who followed their religions in the most peaceful and harmonious manner. There were Buddhist temples, churches and mosques in close proximity to one another. There were many temples scattered in and around Matara, rich in cultural tradition. Matara Bodhiya in the heart of the city was a very popular one among the residents as well as those who go past the sacred place. It is still fresh in my memory how the father of my friend Shiva, the most near and dear to me visited the Bodhiya daily taking a cool evening walk in the evening of his life. Away from the busy city life was Weherahena - a unique example of Buddhist culture. There was yet another equally great one at Dondra which is said to house the Vishnu Devalaya. The devotees in the suburbs did enjoy the festive season. 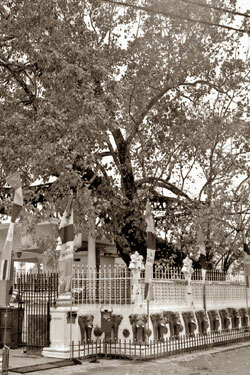 Maha Manthreenda was a prestigious centre for religious education with its concept of Dhamma. The service rendered by these temples for the propagation of Buddhism was marvellous. It is with pride that I recall my student days of Matara. My mind goes back to the flourishing glory of the few leading schools all situated within the city limits. To name them - Rahula College, St. Thomas' Girls' and Boys', St. Servatius, St. Mary's Convent and Sujatha Vidyalaya. Some of them were fee levying schools, with English as the medium of instruction. Leading heads such as D. J. Kumarage, Solomensz, Rev. Fr. Joseph Rajapaksha, Soma Samarasinghe, Regina Balasuriya played a vital role in making their contribution in the sphere of education having produced outstanding students who figured prominently in every sphere. Theirs was hard work filled with devotion. They are remembered with deep gratitude. Matara had also been blessed with medical personnel of high calibre performing an enormous service. They were doctors of repute sought after by patients within the city and the suburbs. Their establishments, Nursing homes and dispensaries were located close to one another. Drs. Conderlag Bultgens, S. A. Wikremasinghe, Mohotty and Karunaratne were a few of them. There were famous Ayurvedic physicians like Pinidiya, Rupasinghe, Kirigoris of Nupe, Wijegunawardena of Godagama, famous Kaluvedamahatmaya, popularly known so, for those who were interested in traditional Ayurvedic treatment. They deserve to be honoured for their selfless service. Matara was in the proud possession of certain distinguished families and eminent personalities who have left a rich history of their valuable contribution to society. C. A. Ariyatilleka, Dharmapala, Harischandra, Justin Wijayawardena, Gunasekaras - Wilfred and Albert, Wijetungas and Wickremasinghes of Hataramanhandiya did perform a superior service with their different political ideologies. With the welfare of people uppermost in their minds, dedicated Ministers Mahanama Samaraweera, B. Y. Thudawe worked hard towards prosperity. They left behind a legacy that cannot be erased. In Matara which I saw 50 years ago - a top achiever in the field of industry in this elite group was Harischandra who spread it islandwide and beyond too. They all have left a memory so valuable which will not fade away with the passage of time. Matara also inherits a magnificent historical background with regard to langauge and literature. Munidasa Kumarantunga a world renowned writer born in the vicinity of Matara, with his passionate devotion brought about a Renaissance in truly "Hela Spirit." It was kept up by professional patriots like Amarasiri Gunawardena, Gamini Thilakawardena, C. Coporahewa, D. V. Richerd Silva and K. W. Pagnapala. Their (Hela Haula) contribution to keep the torch burning should be admired and appreciated. Now back to Nilwala - Nilwala is one of the biggest rivers winding its way through the outskirts providing irrigation to a countless number of paddy fields as the villages mostly depended on agriculture. It had some bathing spots encircled by wooden fences where people used to enjoy bathing, go on boat trips watching beautiful scenery. It is only in Nilwala that you find the grateful crocodiles of the type that miraculously rescued Upali Gunasekera - a wonderful personality brave and courageous who entertained them from "Lands End his home steeped in legend. Matara was surrounded by beautiful villages located in the calm, quiet suburbs with mixed crops, paddy lands, hills and green woods. In some places along side the road there were structures known as bunds (dams) built to regulate the flow of water to benefit the farmer - a notable feature of the colonial era. Little more detail about a village close by - Nadugala since I was fortunate to spend a couple of years of my childhood there. Nadugala was famous for its Kirala trees and it's foliage. Most beautiful rare birds could be seen there. It was blessed with a cool climate with well water for daily use. Next to Nadugala was Watagedara with it's historic temple said to be the oldest, built by early royalty, was frequently visited by my family. Sweet fragrance of the days gone by still linger on the glory and the pride of place that Matara occupied may go on forever. St. Mary's church of Matara enshrining the miraculous statue of the Blessed Virgin. Many with child, statue lost in the sea thrice and miraculously found safe and sound, specially during tsunami 2004 is of great religious significance drawing devotees in thousands from all over the island for the annual feast held in September. It takes me back to the time I was serving St. Servatius College under the late Reverend Father Joseph Rajapaksha under whom we were showered with love and kindness. I remember so well how this dedicated personality made arrangements for the annual feast with utmost devotion. Let this be a tribute to him for the great service rendered.